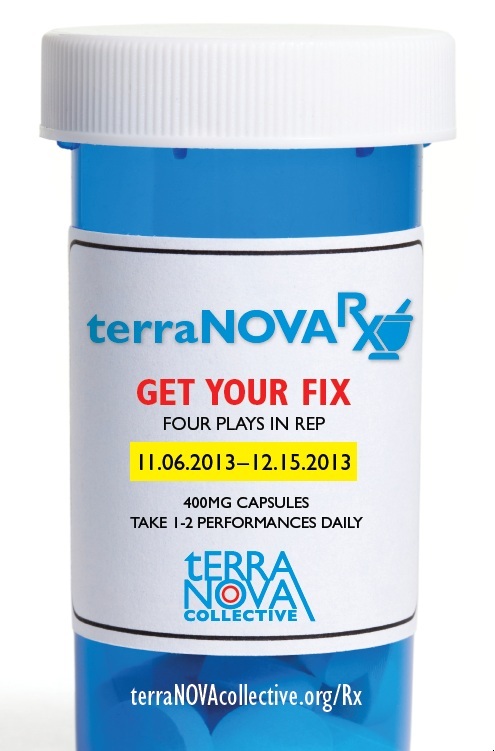 terraNOVA Rx is an extension of terraNOVA's Groundbreakers Playwrights Group which is entering its 5th year. Traditionally, plays developed through Groundbreakers are showcased in the bi-annual Groundworks New Play Series where staged readings are presented to a general and industry audience. Through terraNOVA Rx, we can offer our playwrights an extended experience: the workshop production, and a longer run of 10 performances, to develop their play in front of an audience. As part of our commitment to develop the career of our Groundbreakers playwrights, we invite industry professionals to these workshop productions, a further realization of the playwright's vision. FEATURING J. CLINT ALLEN, SEBASTIAN BEACON, ALLISON BUCK, CHARLES ANDREW CALLAGHAN, CHRISTOPHER RYAN GRANT, DONNETTA LAVINIA GRAYS, NIC GRELLI, BETH HOYT, SANDOR JUAN, EMILY KRATTER, PRESTON MARTIN, KYLE METZGER, ERIC T. MILLER, TOM NELIS, JEANINE SERRALLES, DANIELLE SLAVICK, SAMANTHA STRELITZ, HALLEY WEGRYN GROSS, and NATALIE WOOLAMS-TORRES.